The fees due to music rights-owners for public performances, broadcasts and copies of their work are collected by a number of organisations. This diagram shows a general outline of licenses, fees, royalties and payments. It doesn’t describe every case, e.g. production music and some other applications. 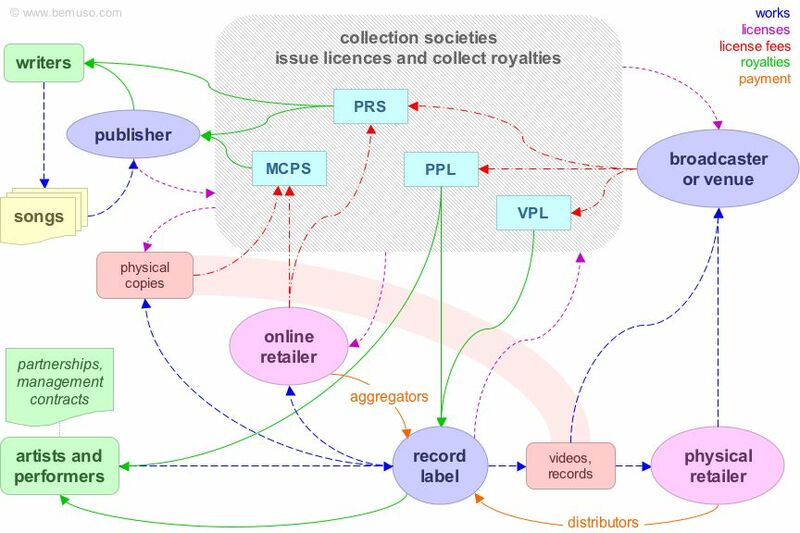 This diagram doesn’t show licenses granted directly by record labels and publishers (e.g. master-use and sync licenses). Also, an artist can be their own label and publisher so these roles are not necessarily separate. The MCPS-PRS Alliance is now called PRS for Music but the licenses of the two separate organisations, their separate fees and legal entities are unaffected by the new name. These are the main UK music rights organisations—other organisations operate in other countries. one-off £10 or £400* + % The Performing Right Society (PRS) licenses the writer’s performance rights and collects royalties. Writer membership allows you to collect royalties from public performances of your songs (including broadcast, recorded and live). Unless your work is being performed in public by third parties there’s no point in joining. Fees marked as a percentage (%) are deducted by the collecting society as a commission on the royalties. Fees charged for licenses vary. The MCPS royalty on CDs is currently 8.5% of PPD, the published price to dealers (wholesale price) or 6.5% of retail before VAT. Downloads and ringtones are charged at a different rate. When performance royalties for recordings were introduced in 1996 P@MRA and AURA were set up to distribute them alongside PPL in the UK. The 2 new organisations were merged into PPL in 2005/2006. P@MRA or PAMRA (The Performing Artists’ Media Rights Association) collected performers’ royalties from PPL and paid artists direct. P@MRA was mainly used by session musicians. AURA (The Association of United Recording Artists) collected performers’ royalties from PPL and paid artists direct. AURA was mainly used by featured artists and producers but also by session musicians. P@MRA and AURA figures were not readily available but their income was reflected in the PPL numbers. P@MRA had 17,000 members and AURA distributed about £2 million each year. Here’s some information about membership, earnings and licenses from the royalty collection societies. UK license fees charged by royalty collection societies can be challenged through the Intellectual Property Office (IPO) Copyright Tribunal. This allows commercial IP users to object if they feel the monopoly power of a particular society is being used to set unfairly high rates. 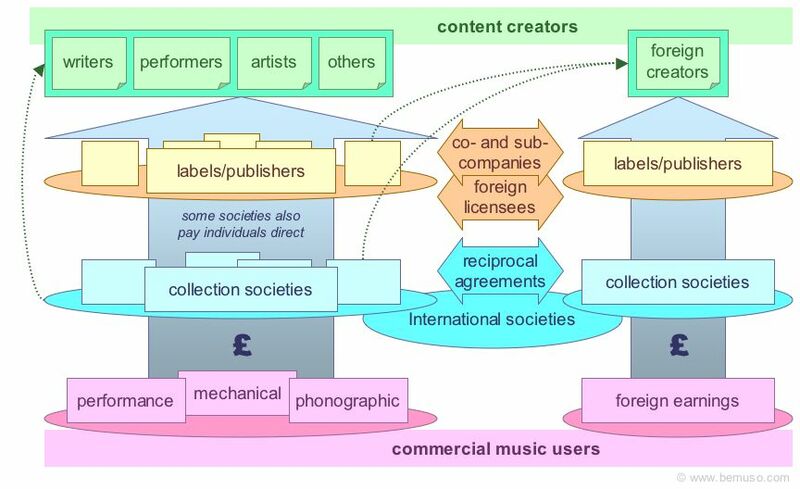 Music industry collection societies have been the subject of frequent challenges. Mechanical royalties for duplicated recordings are collected, and paid to the owners of the song or music copyright. The amount charged for each duplication license is based on the value of the CD, DVD, download or other copies (see A note about the meaning of mechanicals). The publishing royalty collection society for recordings and other mechanical copies in the UK is the Mechanical Copyright Protection Society, MCPS. They operate a number of licenses to collect royalties on commercially duplicated recordings and to allow large payers to settle by account. There’s also a license for duplicating your own copyrights royalty-free. PPL collects royalties on behalf of the recording owners for recordings copied by businesses using music. These are generally intermediate copies (e.g. VT programming) for various kinds of performance rather than copies for sale. PPL call this dubbing. Performance royalties are collected by performing rights organisations (PROs) and paid to performers or owners of public performance rights. The amount charged for each performance license is based on the size of the venue, broadcast advertising revenue, or some other indication of value. There are two performance royalty collection societies in the UK. Performance rights are granted to venues, premises and broadcasters under blanket licenses. This means there are common terms and conditions for rights-owners and license users. Commercial music users pay license fees based on air-time or some other indicator agreed between collection societies and trade bodies. They don’t usually pay for the specific material they use. Details of artists, writers and performers (usage returns or cue sheets) are only kept by major venues or broadcasters. For example, restaurants using music pay annual licenses, and payments to writers and performers are based on statistics from the mainstream and sampling from particular sectors. The distribution of royalty payments from collection societies to performance rights-owners cannot be perfect. License fees from commercial music users are collected, pooled and shared among labels, publishers, writers and performers. The share-out formula is bound to underpay some and overpay others. In the future there may be a comprehensive tracking system for all electronic media but some manual data collection will always be necessary. Fully electronic payment would reduce the cost of royalty administration and make a fairer distribution possible. Some collection societies also have a “black box” of unclaimed royalties which may be kept or given to other organisations (e.g. Musicians’ Union). This money is owed to writers, performers and labels who are named on royalty paperwork but can’t be traced. Unclaimed PPL royalties can be searched at PPL performers’ money (this used to be called Royalties Reunited). Smaller music venues are rarely monitored by PRS so their license fees tend to be distributed to other writers. If you play smaller venues and write your own material you can use the PRS Gigs and Clubs Scheme to claim your royalties. Although the PRS page is for members only it’s quite easy to work out whether you’ll benefit from joining. Small music venues pay a few thousand pounds a year in PRS license fees, and each evening is normally worth about £5 for the writers whose material is used (larger venues pay more). There is a one-off fee of £10 to join PRS as a writer member, so if you clock up 20 evenings or more with material you write you’ll cover your costs. The PRS Live Royalties MySpace page has contact information for claiming other live events and festival appearances. If you don’t claim your royalties they will be paid to Robbie Williams. Where bigger artists perform their own material live the royalty collection process can be a problem. The venue would deduct an amount to cover their PRS license. PRS would collect the license fee and deduct their commission. PRS would calculate the performers’ share of the license fee. PRS would pay the publishers and performers the song royalties. The publishers would pay the writer’s share on to the performers. The royalties would be paid up to a year late, minus commission. To reduce these overheads there are sometimes special payment arrangements for live performances by the writers at big venues. There are different models for royalty collection in different countries. In some countries mechanical and performing rights are administered jointly. SACEM (France), SABAM (Belgium), GEMA (Germany) and JASRAC (Japan) work that way. The scope of collection societies differs from country to country and their roles may overlap differently. The same rights are often administered separately by several societies in a particular country (although each member would only join one society in each territory). SESAC, BMI and ASCAP are all performing rights organisations in the USA. Music rights are based on national law but the EU recognises the problem of too many middle men, and too little competition. Efforts are underway to integrate EU licensing and unified schemes have been introduced for some digital media (e.g. broadcasting). But generally speaking a rights-owner still has to deal with a society in each country (directly or indirectly) and users have to license music on a country by country basis. Members of UK societies have some choice about whether they are represented throughout the world or only specified territories. They can then choose other societies in countries where they are not represented from the UK. composition can only be represented by one publisher in each territory. tax arrangements for local and foreign agents. Some countries (Spain and Japan for example) have withheld a percentage of royalties paid to foreign agents. sub-publishers and licensees in foreign countries. There is no single “best way” to arrange global royalty collection. Each case depends on how a particular artist, label or publisher is represented worldwide and what they need. It often pays to audit foreign royalty collection even when a local society or sub-publisher is supposed to be doing the job. Here are some of the main royalty societies in the rest of the world (India, China, Indonesia and Brazil are also significant markets but not so well administered). There is some overlap between the roles in different countries so these definitions are approximate. There is also different national law, for example countries with media or player levies allocate societies to distribute them. AEPO-ARTIS is a group of performers’ rights societies. BIEM is a reciprocal group of mechanical collection societies. NCB is a group of mechanical collection societies in Nordic and Baltic countries. IFFRO is an international reproduction rights group that represents some mechanicals. In November 2009 the South African mechanical copyright society was wound up in proceedings started by composers. Colin Shapiro a composer and one-time non-executive director runs this information site about the case. I don’t know a single list of all the royalty collecting societies in the world but this site is useful: David Knopfler. Some of the societies and other organisations have useful links pages too. The music organisations links page has links for other UK and international music industry bodies.